I consider it our mission to always keep everyone updated on virals, so here we go. Just yesterday we wrote about a new viral site for Shawn Levy's Real Steel, the upcoming action movie starring Hugh Jackman as the trainer of a giant robot boxing unit. The site is located at WRB.com and is the HQ of the World Robot Boxing League, the not-so-cheesy robot version of the WWE in this. 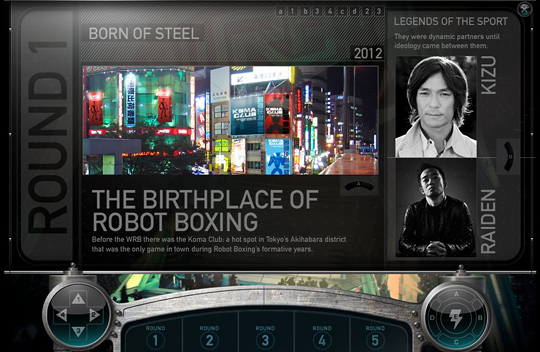 After entering in codes and unlocking the site, its been updated with a series of 5 Rounds, each of which provides copious amounts of backstory to give us a history of how robot boxing first started way back in 2014. There's some very cool stuff to see here! So how did we get there? Well, remote controller units were handed out at PAX East that contained codes. Those codes, once enough of them were entered on WRB.com, unlocked this second phase of the viral. If you open the "Round 1" tab, at the top is another code and multiple pages of information. If you enter in each subsequent code from the top of each page, you'll eventually unlock all 5 Rounds and get an achievement (if you have a site login). And if you make an account, I bet they will even be mailing out some kind of prizes. The badass robot you see at the top with the green eyes is named Zeus, he is the "current world champ and baddest of the bad." Awesome! His profile page is Round 5. If you click on any of the screenshots and enter the codes to unlock all 5 Rounds, you'll also be able to explore the rich history of the WRB, which is actually quite fascinating to see. This is a fantastic way to setup the history and backstory behind Real Steel without having to do it in the movie (as far as we know). 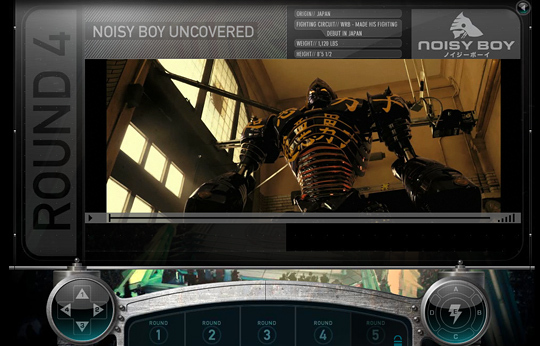 The site introduces us to Zeus as well as another 'bot named Noisy Boy, seen below. Both of these guys also appeared in that first teaser trailer that hit late last year. There are also some badass clips of Noisy Boy and Zeus on the site in Round 4 and Round 5 which I suggest checking out, as that's where that cool shot of Zeus menacingly staring at the camera above originally came from. Other than that, the website hasn't updated beyond these 5 Rounds, but it looks like there is obviously plenty more to come before Real Steel hits theaters on October 7th. Until then, check out WRB.com and sign-up, as it looks like you might get something in the mail if you get to Round 5. "Zeus has a complex past and a brilliant future. No bot can withstand his punishment or power… but it's fun to watch them try." I LOVE that movie! Which is exactly why I can't frickin wait to see Real Steel too lol! Giant robot fighting movies are always awesome. This looks like a good popcorn movie,like the first Transformers,and Jackman wouldn't do it unless the script was worked.